فاضل, فروغ, گنجی خرم دل, ناصر, قیصری, مهدی. (1395). شبیه‌سازی توزیع رطوبت و نیترات در خاک در دو سیستم آبیاری سطحی و قطره ای با استفاده از مدل Eu-Rotate-N در اصفهان. نشریه آبیاری و زهکشی ایران, 10(3), 377-388. فروغ فاضل; ناصر گنجی خرم دل; مهدی قیصری. "شبیه‌سازی توزیع رطوبت و نیترات در خاک در دو سیستم آبیاری سطحی و قطره ای با استفاده از مدل Eu-Rotate-N در اصفهان". نشریه آبیاری و زهکشی ایران, 10, 3, 1395, 377-388. فاضل, فروغ, گنجی خرم دل, ناصر, قیصری, مهدی. (1395). 'شبیه‌سازی توزیع رطوبت و نیترات در خاک در دو سیستم آبیاری سطحی و قطره ای با استفاده از مدل Eu-Rotate-N در اصفهان', نشریه آبیاری و زهکشی ایران, 10(3), pp. 377-388. فاضل, فروغ, گنجی خرم دل, ناصر, قیصری, مهدی. شبیه‌سازی توزیع رطوبت و نیترات در خاک در دو سیستم آبیاری سطحی و قطره ای با استفاده از مدل Eu-Rotate-N در اصفهان. نشریه آبیاری و زهکشی ایران, 1395; 10(3): 377-388. به علت رشد جمعیت جهان و محدودیت منابع آب، آبیاری در کشاورزی باید در جهت تولید محصول بیش­تر با میزان آب کم­تر حرکت کند بنابراین پژوهش­ها بر افزایش کارایی آب و نیتروژن متمرکز شده است که شبیه­سازی عددی راه حل مؤثری در بهینه­سازی مدیریت آب و کود در مزرعه برای رسیدن به بالاترین عملکرد محصول و پایین­ترین آلودگی نیترات خاک، در شرایط بحران کمبود آب می­باشد. این امر لزوم ارزیابی مدل­های جدید با کاربری آسان در شناسایی صحیح توزیع آب و املاح در خاک منطقه و انتخاب بهترین گزینه مدیریتی را نشان می دهد. مدل Eu-Rotate-N برای شبیه­سازی و بهینه­سازی مصرف نیتروژن در تناوب محصولات گیاهی و بدون نیاز به کالیبراسیون، توسعه داده شده است. این پژوهش با هدف بررسی کارایی مدل Eu-Rrotae-N درشبیه سازی توزیع رطوبت و نیتروژن و عملکرد گیاه فلفل تحت دو سیستم آبیاری قطره ای و سطحی در مزرعه ای با بافت لوم رس سیلتی در اصفهان در سال 94 انجام شد. چهار شاخص آماریRMSE ،NRMSE ، r2 و d جهت ارزیابی مدل محاسبه شدند. این شاخص­ها برای رطوبت خاک در هر دو تیمار و در کل پروفیل خاک به ترتیب برابر با 025/0، 26/13، 65/0، 996/0 بودند. هم­چنین برای نیترات و عملکرد گیاه در هر دو تیمار مقدار NRMSE کم­تر از 20 درصد r2 بیش­تر از 90 درصد بود که نشان دهنده کارایی خوب و روند شبیه­سازی بسیار مناسب مدل بود. بنابراین کارایی مدل Eu-Rotate-N در شبیه سازی توزیع رطوبت، نیترات و عملکرد برای گیاه فلفل تایید شد و می­توان از مدل برای شبیه­سازی و بهینه­سازی مدیریت آب در مزرعه در شرایط اقلیمی گرم و خشک در خاکی با بافت سنگین برای گیاه فلفل استفاده نمود. Because of world population growth and limited water resources, irrigation should be moved in direction of producing more yield with less water. Therefore researches has concentrated on improvement of water and nitrogen use efficiency, which numerical simulation is the effective solutions to optimize the management of water and fertilizer in the field in order to achieve the maximal yield and minimal nitrate pollution of soil in water deficiency crisis condition.This shows the necessity of evaluating of new user friendly models to identify the correct distribution of water and solute in the soil and choosing the best management. The Eu-Rotate-N model has been developed for simulation and optimization of nitrogen use in vegetables rotation and without the need to calibration.This study in 2015 was conducted to evaluate the efficiency of Eu-Rate-N model in simulation of moisture and nitrogen distribution and yield under drip and surface irrigation system and for pepper plant in a farm with silty clay loam soil in Isfahan. Four statistical index, RMSE, NRMSE, r2, d in order to model validation was calculated. These indexes for soil water content in both treatments and in the complete soil profile were 0.025, 13.26, 0.65, 0.996 respectively. Also NRMSE for soil nitrate content and plant yield in both treatment was less than 20 percent and r2 was more than 90 percent which pointed out to well efficiency and well process of simulation of the model. So the Eu-Rotate-N model efficiency for simulating soil water and nitrate content distribution and yield for pepper was confirmed and we can use Eu-Rotate-N model for the simulation and optimization of agricultural water management in the hot and dry climate conditions in heavy soil texture for pepper. خرمی،م، علیزاده،ا و انصاری،ح. 1392. شبیه­سازی حرکت آب و توزیع مجدد رطوبت در خاک در آبیاری قطره­ای توسط مدلHYDRUS 2D/3D، نشریه آب و خاک(علوم و صنایع کشاورزی). 27. 4: 692-702. دانشور،م.ح. 1383. پرورش سبزی، انتشارات دانشگاه شهید چمران، چاپ سوم، 461صفحه. کریمی،ز. 1388. بررسی اثر تیمارهای مختلف مالچ در تحمل به خشکی و دیگر صفات کمی و کیقی ارقام فلفل شیرین، پایان­نامه کارشناسی ارشد، دانشگاه فردوسی مشهد. ملکیان،ر و قیصری،م.1390. حساسیت سنجی مدلCERES-Maize نسبت به ظرفیت زراعی خاک برای شبیه سازی سرنوشت نیتروژن در نیمرخ خاک. 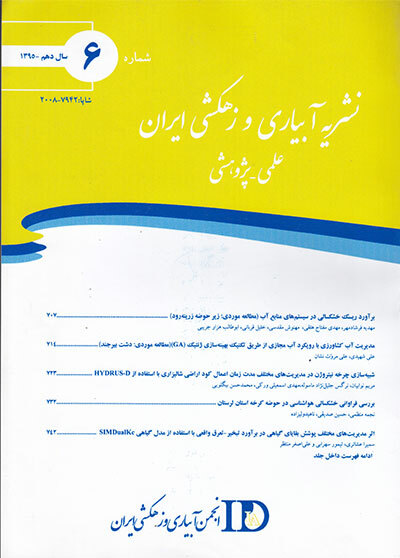 حفاظت منابع آب و خاک.2: 1-13. Agrawal,N and Agrawal,S. 2005. Effect of drip irrigation and mulches on the growth and yield of banana cv. Dwaraf Cavendish. Indian Journal of Horticulture. 62.3: 238-240. Allen,R.G., Pereira,L.S., Raes,D and Smith,M. 1998. Crop evapotranspiration-guidelines for computing crop water requirements. Irrigation and drainage paper 56, Rome, Italy. 300 p. Brisson,N., Gary,C., Justes,E., Roche,R., Mary,B., Ripoche,D., Zimmer,D., Sierra,J., Bertuzzi,P., Burger,P., Bussiere,F., Cabidoche,Y.M., Cellier,P., Debaeke,P., Gaudillere,J.P., Henault,C., Maraux,F., Seguin,B., Sinoquet,H. 2003. An overview of the crop model STICS. European Journal of Agronomy, 18:309–332. Burns,I.G. 1974. A model for predicting the redistribution of salts applied to fallow soils after excess rainfall or evapotranspiration. European Journal of Soil Science. 25:165–178. Cote,C.M., Bristow,K.L., Charleworth,P.B and Cook,F.J. 2003. Analysis of soil wetting and solute transport in sub-surface trickle irrigation. Journal of Irrigation and Drainage Engineering. 22.3-4:143-156. Doltra,J., Mu˜noz,P. 2010. Simulation of nitrogen leaching from a fertigated crop rotation in a Mediterranean climate using the EU-Rotate N and HYDRUS-2D models. Agricultural Water Management Journal, 97:277–285. Doltra,J., Mu˜noz,P., Antón,A. 2010. Soil and plant nitrogen dynamics of a tomato crop under different fertilization strategies. Acta Horticulturae. 852:207–214. Guo,R., Nendel,C., Rahn,C., Jiang,C., Chen,Q. 2010. Tracking nitrogen losses in a greenhouse crop rotation experiment in North China using the EU-Rotate N simulation model. Environmental Pollution Journal, 158:2218–2229. Hansen,S., Jensen,H.E., Nielsen,N.E and Svendsen,H. 1991. Simulation of nitrogen dynamics and biomass production in winter-wheat using the Danish simulation-model DAISY. Fertilizer Research, 27:245–259. Keller J. and Bliesner R.D. 1990. Sprinkle and Trickle Irrigation. Published by Van Nostrand Reinhold New York, p:643. Liao,C.F.H and Bartholomew,M.V.1974. Relation between nitrate absorption and water transpiration by corn. Soil Science. Socitey. American. Procceding. 38: 472-479. Nangia,V., Gowda,P.H., Mulla,D.J., Sands,G.R. 2008. Water quality modeling of fertilizer management impacts on nitrate losses in tile drains at the field scale. Journal of Environment Quality. 37:296–307. Nendel,C. 2009. Evaluation of best management practices for N fertilisation in regional field vegetable production with a small-scale simulation model. European Journal of Agronomy. 30.2:110-118. Nendel,C., Venezia,A., Piro,F., Ren,T., Lillywhite,R.D and Rahn,C.R. 2013. The performance of the EU-Rotate N model in predicting the growth and nitrogen uptake of rotations of field vegetable crops in a Mediterranean environment. The Journal of Agricultural Science. 151:538–555. NRCS. 2004. Estimation of direct runoff from storm rainfall. In:National Engineering Handbook, Part 630. Hydrology, USDA. Pattanaik,S.K., Sahu,N.N., Pradhan,P.C and Mohanty,M.K. 2003. Response of Banana to drip irrigation under different irrigation designs. Journal of Agricultural Engineering. ISAE. 40.3:29-34. Rahn,C.R., Zhang,K., Lillywhite,R.D., Ramos,C., De Paz,J.M., Doltra,J., Riley,H., Fink,M., Nendel,C., Thorup-Kristensen,K., Pedersen,A., Piro,F., Venezia,A., Firth,C., Schmutz,U., Rayns,F., Strohmeyer,K. 2010. A European Decision Support System, EU-Rotate_N to predict environmental and economic consequences of the management of nitrogen fertilizer in crop rotations. European Journal of Horticultural Science. 75.1: 20-32. Ritchie,J.T. 1998. Soil water balance and plant water stress. In: Tsuji,G., Hoogenboom,G., Thornton,P. (Eds.) Understanding Options for Agricultural Production. Kluwer Academic Publishers. Dordrecht: 41–54. Sadeghi,A.M., Mcinnes,K.J., Kissel,D.E., Cabrera,M.L., Koelliker,J.K., Kanemasu,E.T. 1988. Mechanistic model for predicting ammonia volatilization from urea. In: Bock,B.R., Kissel,D.E. (Eds.). Ammonia Volatilization from Urea Fertilizers. National Fertilizer Development Centre, Tennessee Valley Authority, Muscle Shoals, Alabama: 67–92. Sankar,V., Lawande,K.E and Tripathy,P.C. 2008. Effect of micro irrigation on growth, yield and water-use-efficiency of onion (Allium Cepa) under western Maharashtra conditions. Indian Journal of Agricultural Sciences. 78.7: 584-588. Savage,M.J. 1993. Statistical aspects of model validation. Presented at a workshop on the field water balance in the modeling of cropping systems, University of Pretoria, South Africa. Skaggs,T.H., Trout,T.J., Simunek,J and Shouse,P.J. 2004. Comparison of HYDRUS-2D simulations of drip irrigation with experimental observations. Journal of Irrigation and Drainage Engineering, 30: 304–310. Soler,C.M.T., Sentelhas,P.C and Hoogenboom,G. 2007. Application of the CSM-CERES-Maize model for planting date evaluation and yield forecasting for maize grown off-season in a subtropical environment. European Journal Agronomy. 27: 165-177. Soto,F., Gallardob,M., Giménezc,C., Pe˜na-Fleitasb,T., Thompsonb,R.B. 2014. Simulation of tomato growth, water and N dynamics using the EU-Rotate N model in Mediterranean greenhouses with drip irrigation and fertigation. Agricultural Water Management, 132:46–59. Sun,Y., Hua,K., Zhangb,K., Jiangc,L and Xuc,Y. 2012. Simulation of nitrogen fate for greenhouse cucumber grown under different water and fertilizer management using the EU-Rotate N model. Agricultural Water Management, 112:21– 32. Yang,D.J., Zhang,T.Q., Zhang,K.F., Greenwood,D.J., Hammond,J.P., White,P.J. 2009. An easily implemented agro-hydrological procedure with dynamic root simulation for water transfer in the crop-soil system: Validation and application. Journal of Hydrology. 370:177-190.